Have you worked on projects that only produced temporary benefits? Locking in improvements and even continuing to ratchet up the performance of your processes can be challenging; many would say the most challenging piece of continuous improvement. It is also this work that begins to move the culture forward. A powerful tool that all too often groups do not make full use of is Visual Management. It is often said that if we want people to be accountable and responsible, they need to have access to the data. 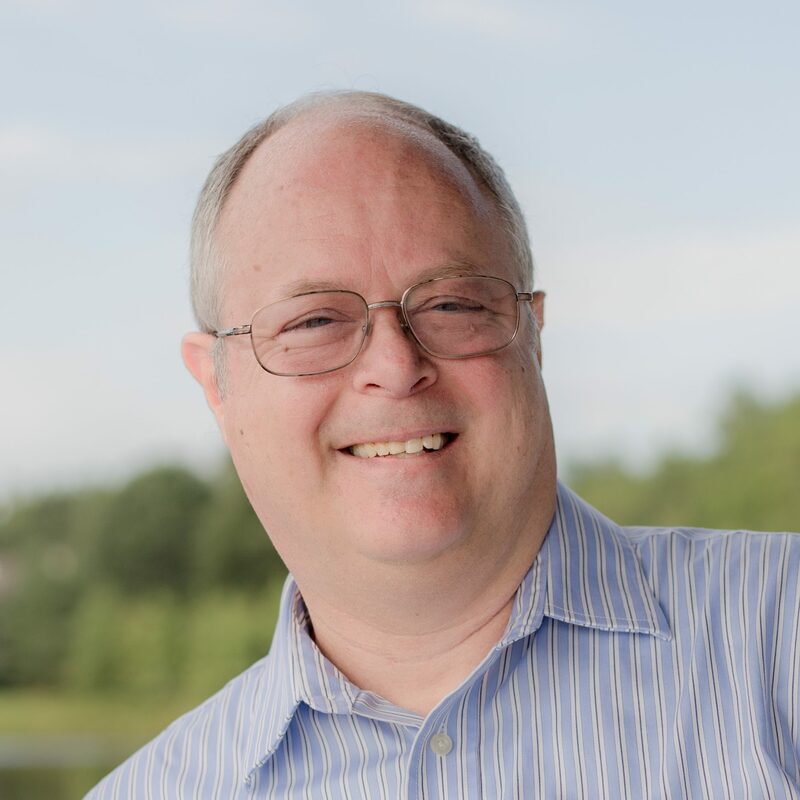 While the processes of Lean Six Sigma frequently employ multiple methods to uncover better ways of accomplishing what we need for our customers, the biggest challenge that most organizations face in continually improving their business is holding on to the gains produced and helping people continue to make improvements as time passes. Visual Management works by keeping key metrics that people can use for managing their work in front of them. A major health insurance carrier in a state was migrating to a new production system for all of their claims. The previous system was based on 30 year old technology and support of the “legacy” system was becoming expensive and time consuming. The migration to the new system was to be a multi-year project. There is a state mandate that all medical claims should be paid within a specified number of calendar days of receipt of required claim information. If the payment exceeds that time, there is a penalty applied to the payment amount. This penalty is prorated by the number of days over the specification days and paid to the provider, either a hospital or physician. The new administration system is based on current technology and supported by a leading vendor in the field of claim administration systems. The new system allows easier and timelier reporting of data captured in the system. The migration of accounts started in 2007. In 2008, nearly 2.5% of claims paid with the new system were having an interest penalty applied to them. These penalties were seen by the organization as a cost of doing business, but with less than half of the members migrated to the new system, the volume of dollars would increase dramatically if the issue was not addressed. In 2009, two Lean Six Sigma projects were completed to address the growing volume of claims with interest penalties. The projects were separated by addressing electronic claims versus paper claims submissions. Some processes used in the “legacy” system were still being applied in the new system. The processes to “review” adjudicated claims for accuracy were time consuming. There was no exposure of the penalty dollars to the management of claims processing. The third bullet had the biggest impact. In the past, penalty dollars were thought to be the responsibility of the financial areas of the corporation, since it dealt with dollars being paid. With more rigorous reporting and information available to the claims processing areas, this has brought awareness to the cost of having claims being paid “late” to the forefront of claims management. A process was implemented whereby interest penalty statistics are discussed on a weekly and monthly basis with the claims processing management. The migration to the new system was completed in 2011. 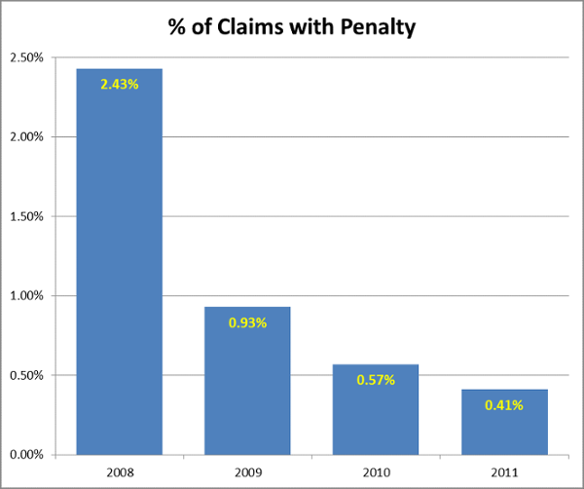 The charts below reflect the downward trend in the percentage of claims associated with interest penalties over the past 4 years. There is still room for improvement, but we have started the trend in the correct direction and have prevented an additional $2M in 2011 if the same penalty rate had continued through. All formal changes to the process from the work were implemented in 2009 and had a positive effect on reducing the frequency of penalties and the dollars associated. Several ideas kicked off smaller efforts to address aspects of the bigger issue. Volume of work processed has increased more than fourfold, and the visibility of the process performance and continued focus on addressing issues has been a critical aspect of the company’s financial performance. As the data has remained a focus on the dashboard, management has continued to find ways to see the process with “new eyes” and uncover ways to further refine the process and reduce the penalties.